The best heat transfer, separation and fluid handling technologies. Creating the best heat transfer, separation and fluid handling technologies in the world for more than 125 years, Alfa Laval's products and solutions are used in such areas as food and water supply, energy, environmental protection and pharmaceuticals. 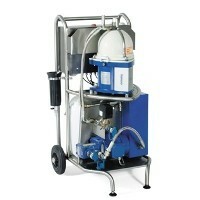 This mobile centrifugal separator effectively removes both particles and water from oils widely used in industry. This dramatically increases oil service life, and reduces wear on all kinds of equipment.